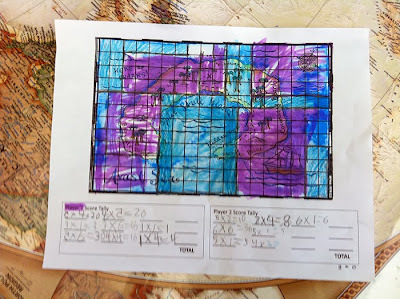 My daughter's 3rd/4th grade class has been working on arrays over the last few weeks. (I recently found out they are using the TERC Investigations curriculum, which seems really strong. Arrays are the first investigation for the 4th grade sequence.) 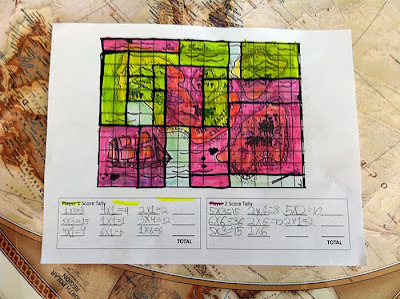 One of their homework assignments was to find, draw and quantify examples of arrays in their environment at home and at school. Of course, I love that! It reminded me of a game I created for my daughter and I to play in the spring of 2012. 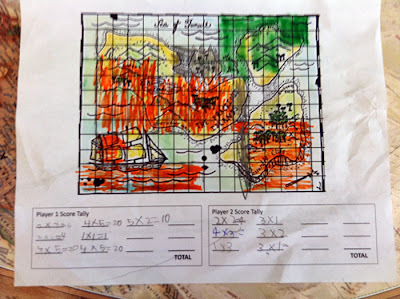 The post about the activity is called Totally Territorial: Cats, Maps, Area & Multiplication. Essentially, I drew a grid over a map of our fair city and, armed with dice and some pens, we staked out our claim. It was totally fun and my almost-seven-year-old was completely into it. Since they are in the middle of a world geography unit (meaning maps!) 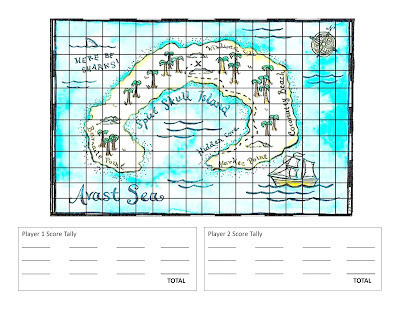 in addition to their array inquiry I thought it might be fun to formalize the game for the class. 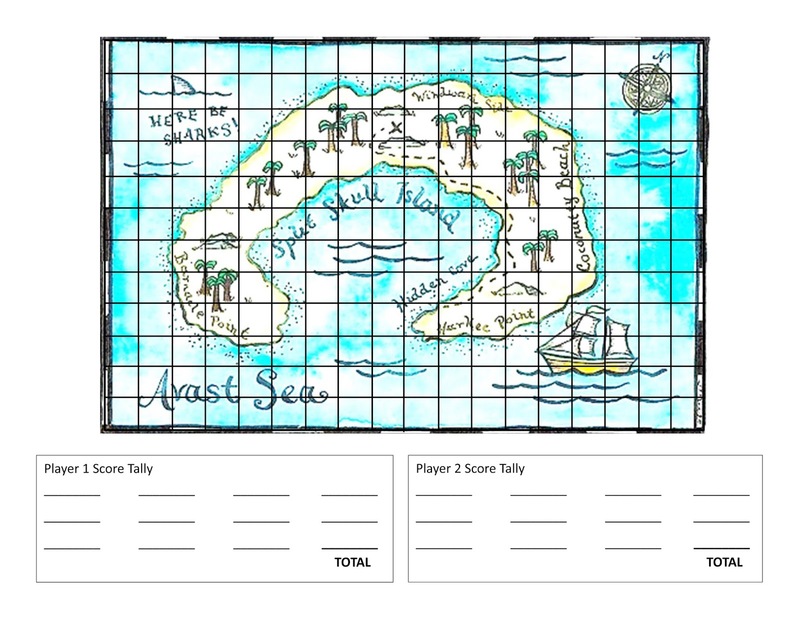 I searched for 'maps of imaginary places' and found a bunch at The Explorer's Notebook, created some grids and a game structure and....voila! Purpose of the Game:To capture as much area on your map as possible. Roll one dice to determine who starts the game. Roll one dice. First roll determines the number of horizontal squares/length. Second roll determines number of vertical squares/width (include the first horizontal row in your count). Outline or highlight your full array in your chosen color. Compute total area (total number of squares) for each turn. Game is over when all territory is captured or both players have both had two unsuccessful turns (meaning not being able to find enough area to capture based on their roll). Player with the most territory/area wins although you may want to consider the value of land vs. water in the final value of area claimed. They played it today (while I was working with small groups working on half-ness, midpoints, congruence and three-ness with this Sierpinski Triangle activity from The Fractal Foundation). Their teacher said they were all completely into it for the entire math class. From what he overheard, it was unclear if the kids had developed any over-arching strategy at this point. More likely, he thinks, they were simply enjoying rolling the dice, computing the area, and capturing territory. I know I'm not on the cutting edge of game design, but the fact that 27 kids were happily engaged in mathematical activity for almost an hour probably says a lot. 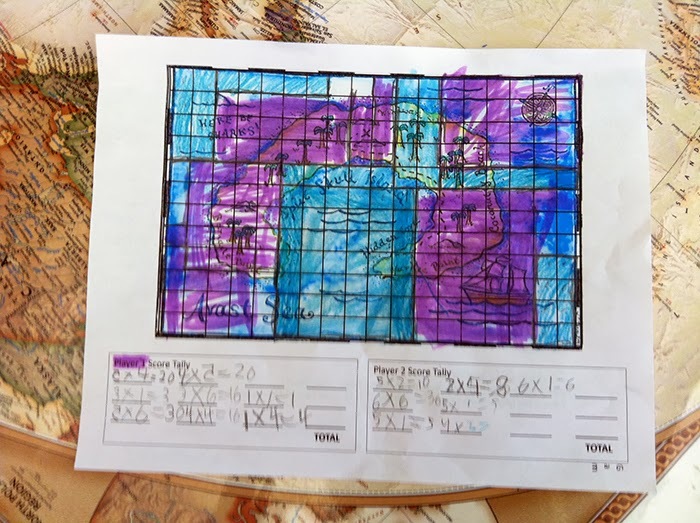 The teacher and I did discuss upping the difficulty by adding a rule about only being able to add territory attached to previously won territory. I love the idea, but think you'd need a bigger playing area for that. Wanna' play? Here are the files! Please do let me know how it goes and what modifications/improvements you made to the execution, or any design suggestions you might have. Great idea. I wonder if there is anything similar to fraction operations? This is great. I've seen a similar game, but it didn't involve the map. The map makes it much more interesting. 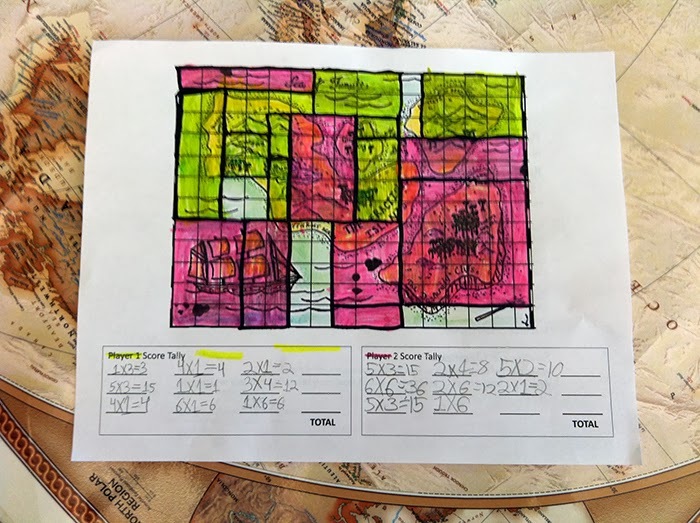 Math in Your Feet on The Friday Zone! "What I Like About Math"